The double barreled salvo of Falcon 9 blastoffs both involve launches of commercial communications satellites – first for Orbcomm followed by SES – and are specifically devised to allow a gradually ramp up in complexity, as SpaceX introduces fixes for the launch failure and multiple improvements to the boosters overall design. The order of launches for the inaugural Return to Flight slot has been switched from SES to Orbcomm by mutual agreement since it involves using a simpler launch profile, according to announcements by both Orbcomm and SpaceX. “As we prepare for return to flight, SpaceX together with its customers SES and Orbcomm have evaluated opportunities to optimize the readiness of the upcoming Falcon 9 return-to-flight mission,” SpaceX officials said in a statement. As currently foreseen, the Falcon 9’s targeted liftoff timeframe is expected to take place in approximately six to eight weeks – roughly corresponding to early December 2015. “This change does not affect the timeline for SpaceX’s return-to-flight mission which is still targeted to take place in the next 6-8 weeks,” noted SpaceX. 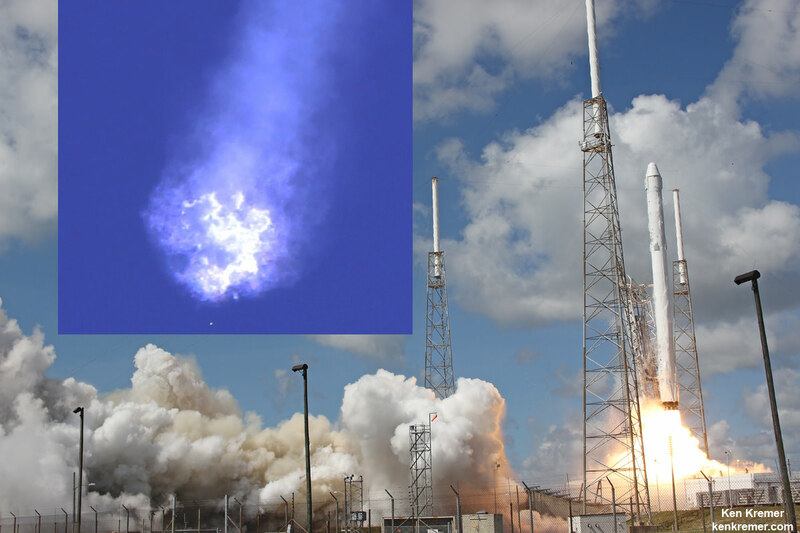 “ORBCOMM and SpaceX plan to launch eleven OG2 satellites from Cape Canaveral Air Force Station in Florida on the next launch of the SpaceX Falcon 9 rocket targeted to take place in the next six to eight weeks,’ said Orbcomm in a statement. All SpaceX launches ground to an immediate halt this past summer when the commercial two stage Falcon 9 booster carrying a SpaceX Dragon spacecraft heading to the ISS on a critical resupply mission for NASA were unexpectedly destroyed by an overpressure event 139 seconds after a picture perfect blastoff from Space Launch Complex 40 at Cape Canaveral Air Force Station in Florida on June 28 at 10:21 a.m. EDT. December is shaping up to be a very busy month for crucial ‘Return to Flight’ rocket launches on the Florida Space Coast. SpaceX competitor Orbital ATK and has set Dec. 3 for the ‘Return to Flight’ launch of their Cygnus supply ship on a cargo mission to the ISS. Cygnus will fly on a ULA Atlas V while Orbital ATK continues work to fly a new version of their commercial Antares rocket which exploded seconds after blastoff to the ISS on Oct. 28, 2014. SpaceX executives are eager to resume launches as rapidly as possible, and at a swift cadence, since they have a huge backlog of customer bookings involving over 50 launches. SpaceX is also vying for lucrative new contracts from the US Air Force to launch the nation’s most capable, high value and expensive national security satellites critical to US national defense. The launch of the SES-9 satellite for SES would quickly follow OG2 and could come as soon as late December 2015. “The SES-9 launch is currently targeted for late December 2015,” SpaceX stated. SpaceX engineers apparently decided that it was best to fly the Orbcomm payload first because the launch profile was less demanding since it did not require a reignition of the Falcon 9 second stage Merlin engine. Instead SpaceX with use the Orbcomm-2 flight to demonstrate an in flight test of the second stage relight system after first deploying the payload as a confidence building measure for subsequent missions. Orbcomm executives are apparently delighted to get first crack at the opportunity to launch their payload of eleven Orbcomm OG2 satellites on the ‘Return to Flight’ Falcon 9 launch which also features the first actual test flight test of the second stage strut modifications as well as several upgrades to the Merlin engines and rocket. “We are excited to launch our eleven OG2 satellites aboard SpaceX’s newly upgraded Falcon 9 rocket and have full confidence in SpaceX and their dedication to this launch,” said Marc Eisenberg, ORBCOMM’s Chief Executive Officer. SpaceX has already notched one successful launch for Orbcomm when the first six Orbcomm OG2 satellites lifted off on July 14, 2014. “This next dedicated launch will mark ORBCOMM’s second and final OG2 mission, completing its next generation satellite constellation,” notes Orbcomm. Sierra Nevada Corporation is the prime contractor for ORBCOMM’s OG2 satellites. They will be shipped to Cape Canaveral at the end of October. SES also has a history with SpaceX. The SES-8 telecommunications satellite launched on the 224 foot tall Falcon 9 on Dec. 3, 2013 from Cape Canaveral. SES-9 like its predecessor is targeted to geostationary transfer orbit that requires reignition of the Falcon 9 second stage engine. “The on-orbit test, combined with the current qualification program to be completed prior to launch, will further validate the second stage relight system and allow for optimization of the upcoming SES-9 mission and following missions to geosynchronous transfer orbit,” says SpaceX. Does anyone know if SpaceX is still planning to do a full duration static fire test on the new booster at McGregor? I really wish the Rocket Cows at McGregor would update their Facebook page more often! They do full duration burns on all their boosters at McGregor before shipping them off to launch sites, I thought?